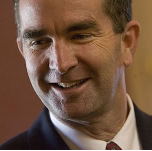 RICHMOND, Va. (AP) - New Virginia Gov. Ralph Northam is asking the Republican-backed General Assembly to pass a progressive agenda that includes expanding Medicaid, stricter gun regulations and protecting abortion rights. The governor made his remarks in a major address to state lawmakers Monday, saying that voters sent a clear message in last November's election when Democrats made major gains. His remarks came the same day a GOP-led legislative panel defeated a top Northam priority to expand background checks on gun buyers. Northam may find better luck with his call for extra money for education, which Republicans have also championed. The governor wants more money for a student grant program for training in high-demand fields, as well as extra funds to help recruit and retain public school principals, teachers and support staff.